The Huichola people are the only people who had divinized a plant as his supreme being. At least is what is told us by the observer Benedict Allen. 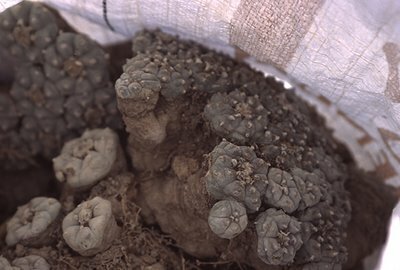 And peyote are the few medicine they have for healling infections, since their Antibiotic propreties. 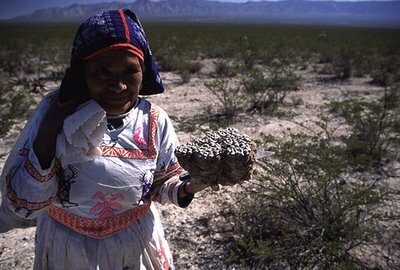 Since they have such a strong relation with peyote, they feel like they were part of Nature. Mostly because all of them are iniciated in Peyote trip's. That's why, and like Timothy Learry and Hoffman told us, everyone should give a try on Psycadelics to find is place on Nature. Keep the good post. 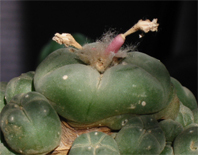 Anyway, i've failed on grafting peyote in Opuntis =( i did with Gymnocalicium but not with Peyote. But i will try again. Anderson (Peyote - The Divine Cactus, 2nd edition, p. 15) says: "The Huichols also believe that 'peyote is for learning', that 'those with strong hearts will receive messages from the gods' (quoted in Schaefer 1996, n.p. ), and in October they engage in a sacred pilgrimage to Wirikuta, the land where peyote grows. A successful trip will ensure the growth of their maize, their children and all of nature."